As a specialist newborn and baby photographer, I take the safety of my little clients very seriously. It might surprise you to know that the newborn photography industry is completely unregulated. Photographers like me, who take safety seriously, have to take it upon ourselves to be trained and educated on how to ensure the beautiful images we create, are done safely. This is much more than knowing how to get baby into some of the more difficult poses – it’s about watching carefully to ensure that they are comfortable, that no part of their delicate body is being squashed, that they are warm enough but not too warm, that the props I use are free from any sharp edges or uncomfortable bits, and to ensure that your baby is safe and secure at all times with me. Being a newborn and baby photographer requires a unique set of skills and there is a worldwide organisation that exists to support photographers like me, who want to have access to safety training and resources that we can use to provide clients like you with a better service. 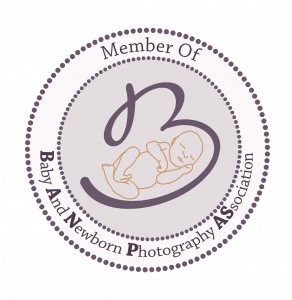 I’m delighted to have joined BANPAS (Baby &Newborn Photography Association) and you will be able to find me on their directory of photographers here. They also have a fabulous facebook page for pregnant and new parents here where you can learn about what to expect from your newborn photographer, and some questions to ask before you book! I’d be delighted to chat to you about how I can create a beautiful gallery of images for your newborn and very happy to chat to you about how I do that safely. Please contact me for booking and availability information.